Content Development - Reallusion Wiki! This is the index page of Reallusion Content Development Wiki. Developers can design their own character content, and apply them to fully-rigged character bases. Get information about the CC content specification and categorization. 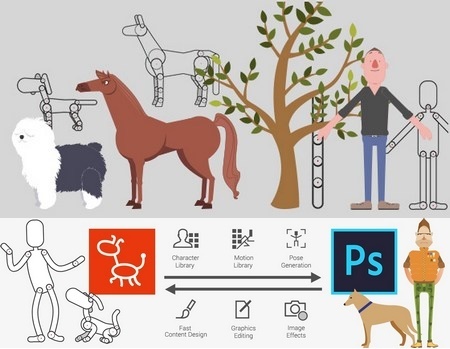 Find out what CC content specification is all about and Character Creator component types. 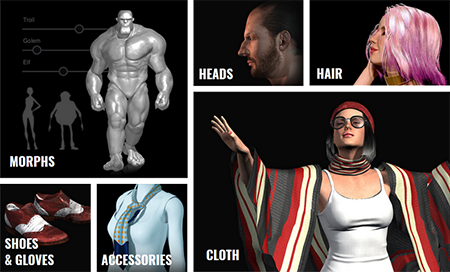 Learn how to create garments, shoes, gloves, hair, and accessories for Character Creator. Includes information about preparation, production, and submission. Learn to create morphs for the character's head and body. Includes information about preparation, production, submission, and publishing. Learn how to use Character Creator efficiently. Includes basic to professional learning resources and forum discussions. Learn resources for Daz & Poser developers who want to familiarize themselves with the Character Creator conversion process and make the most out of Daz & Poser content inside CC. Some materials for better visualization of your artwork and content. Includes characters poses, lit projects, and goodies such as mirror floor. 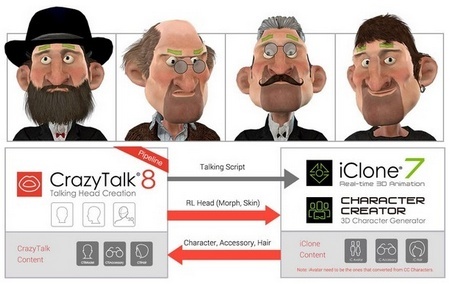 CrazyTalk Animator 3 now provides a fully functional PSD in-and-out solution to not only help 2D Animators, but also Graphic Designers by saving lots of time on character creation and animated content development. Learn about CTA contents such as character, actor, head, body, accessory, animation , scene, and prop. Learn to create CTA actors, props, accessories, hair, and motions. Learn how to use CrazyTalk Animator efficiently with the online user manual, various tutorials, and forum discussion. Learn to use the Uploader software to submit your CTA content for the Marketplace. 3D Head (.RLHead) can be created from a 2D image/photo natively by using the CrazyTalk 8 Pipeline, while the actor, clothing, hair and accessory are converted from iClone/Character Creator 3D assets. Therefore, please learn how to create 3D contents in Character Creator first, and then bring the contents back to CrazyTalk 8 Pipeline to save them as CT contents. Learn about content CT content specification for head, actor, body, cloth, hair, and accessories. Learn useful tricks such as creating the 3D head from 2D image and photos by using the the CrazyTalk 8 Pipeline and converting iClone and Character Creator 3D assets to actor, cloth, hair, and accessory. Learn to publish content to the Marketplace via the Uploader.
! This section is incomplete. This is because it's still under construction. This page was last modified on 10 February 2019, at 19:33.